Sedation Dentistry involves the use of sedatives in order to produce a relaxed state for dental treatment. Dental sedation is an excellent solution for anxious or fearful patients or patients that need to undergo extensive treatments. Sedation Dentistry in Frederick Maryland - Our Doctors can take the fear out of dental work. IV Sedation is the deepest form of sedation dentistry that our doctors administer to patients. Medications are delivered intravenously to the patient (specific types and combinations of medications vary from patient to patient and depend upon a review of the relevant medical history for each patient). IV sedation induces a state of consciousness during which patients will likely not respond to commands and the doctor will monitor vital signs with highly techical equipment to ensure the patient is safe. The procedure (from the patient’s perspective) will seem to last only a few minutes and may not be remembered anything. 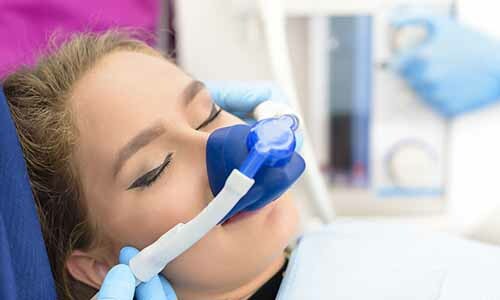 The IV sedation dentistry method we administer here at PerlFection Dentistry is a widely accepted and safe procedure that can greatly benefit anxious and fearful patients. This option enables them to receive the dental treatment that they need in order to maintain optimal oral health. Longer procedures that might usually require multiple appointments can be done in just one with the use of IV sedation. At PearlFection Dentistry in Frederick and Urbana Maryland we are committed to providing our patients with highly personal and individualized care. We understand that dental anxiety is a real and serious concern for many people. We are here to ensure that our patients can receive the care they need in a way that makes them comfortable and safe individually. Other forms of sedation dentistry performed at PearlFection Dentistry include oral medication, nitrous oxide (laughing gas), and IV sedation. All of these forms of dentistry are considered sedation dentistry. PearlFection Denistry, with our team of specialist dentists is uniquely qualifed to perform sedation dentistry techniques that other offices may not be certified for. This allows us to complete extremely high-end dentistry, across multiple specialities, all under one roof. If you have been avoiding the dentist due to anxiety please contact us to learn more about what IV sedation dentistry can do for you. Call PearlFection Dentistry at (301) 831-8303 to schedule your appointment!